Absolute Home Improvements Inc. is your #1 Milwaukee attic insulation contractor. Our main objective is to offer top quality attic insulation materials, at an affordable installation rate, in an effort to build strong and permanent relationships with our clients throughout the Milwaukee area. As a leading full-service attic insulation company, Absolute Home Improvements offers a comprehensive range of products. We can help you choose the ideal insulation to suit your home and make an impression that’s sure to wow. We take the time to discuss with you all possible attic insulation options from materials, styles and quality to functionality, durability, practicality, pricing and time. 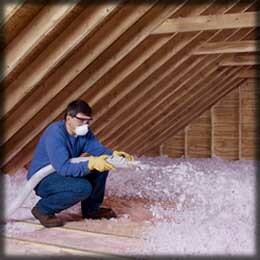 Below you will find a little more information on the most common Milwaukee attic insulation company services we offer. When it comes to fiberglass attic insulation if your home is as little as 5 to 10 years old, you likely have one of the 46 million under-insulated homes in the United States. The department of energy recommends that Wisconsin residents have R-49 insulation in your attic space and most Wisconsin homes have a R-30 and below. Heating and cooling cost account for 50% to 70% of the energy usage in the average home. By adding new fiberglass attic insulation and perform air sealing on all points in your attic space you can help cut the cost of your energy bill. Why should we install fiberglass insulation? Fiberglass does not settle much over time thereby maintaining its R-value with age. Fiberglass is not absorbent and will not hold water. If it does become moist, it will dry out and return to its original R-value. Fiberglass does not support combustion and requires no other chemicals for fire retardation. We install the following types of insulation in your attic space. We install fiberglass blown in insulation. We install fiberglass batt insulation. Beside all the energy saving attic insulation will bring to your home there is also the fact that if your home has ice dams, attic insulation could be the leading contributor to them. Without effective cross-ventilation, summertime heat buildup in the attic can result in a wasteful and costly strain on a home’s cooling system and on your comfort. And in the cold months of winter, harmful ice dams can form if trapped moisture is not removed. A well-ventilated attic, on the other hand, has under eave or soffit vents, which allow fresh air into the attic. Installing attic baffles between rafters keeps air flowing properly up to the ridge, where vents allow the air to exit, helping to keep your home comfortable and dry. Why should we use rafter vent attic baffles? Rafter vent attic baffles help extend the life of your roof. Rafter vent attic baffles help with ice damming issues. 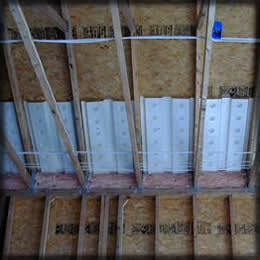 Rafter vent attic baffles help with mold issues in your attic space. Are they a fully licensed Milwaukee attic insulation company with the state of Wisconsin? The proper licenses are needed to obtain all the proper permits to perform your job. We are a fully licensed contractor. Does the Milwaukee attic insulation contractor carrier a 1 million dollar liability insurance policy? This protects your belonging and anyone not employ by Absolute Home Improvements from injury. We carry a 2 million dollar liability insurance policy. Does the Milwaukee attic insulation contractor carrier a workman’s comp policy? This protects you from someone employed by them from suing you because of injury. We carry a workman’s comp policy. Do they offer a workmanship warranty? We offer a lifetime workmanship warranty. Does the Milwaukee attic insulation contractor install the materials according to the manufactures speciation? Most Milwaukee painting contractor takes short cuts in this area to bring the cost down, voiding your painting manufacturer’s warranty. 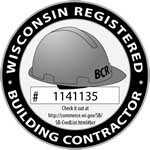 Does the Milwaukee attic insulation contractor provided lien waiver on completion? This is very important because if you are not provided a lien wavier from the Milwaukee gutter contractor you could be responsible for paying for the materials if the gutter contractor fails to pay for them. Does the Milwaukee attic insulation contractor provide you with testimonials and job photos? We offer all of the above. Does the Milwaukee attic insulation contractor provide you with a detailed estimate? We go as far to list every piece of materials needed down to the nails and staples so you know exactly what you’re getting. Absolute Home Improvements Inc. prides itself in going green by recycling all items that are removed from your home that are available for recycling. Most Milwaukee attic insulation contractor does not match our recycling program. Due to the decreasing landfill space prices are getting higher to dump so it is more cost effective to recycle rather than dump into a landfill. It’s a win; win for everyone so why not recycle. It's estimated that 43% of your home's energy usage is for heating and cooling your home. Combined, it is by far, the largest expense on your energy bill. Depending on the age and condition of your attic insulation in your home, an upgrade to current energy saving designs in doors can save you significantly for years to come.